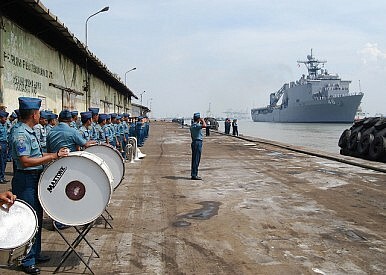 Members of Indonesia's Navy Band during CARAT exercises with the United States. Indonesia’s pursuit and seizure of the vessel is in line with a broader crackdown on illegal fishing instituted under President Joko “Jokowi” Widodo, a practice which he says costs the country annual losses of over $20 billion a year (See: “Explaining Indonesia’s ‘Sink the Vessels’ Policy Under Jokowi”). Indeed, as I reported earlier this week, Indonesia plans to blow up 70 foreign ships when the country celebrates the 70th year of its independence on August 17 – the largest mass public sinking of foreign vessels under Jokowi’s tenure thus far (See: “Why is Indonesia Sinking 70 Foreign Vessels on its Independence Day?”). Slave labor in the fishing sector is hardly a new phenomenon in Southeast Asia. But the issue has once again been in the limelight over the past few months, with particular attention on Thailand’s abuse-ridden, labor-starved fishing industry which has been subject to growing international furor (See: “Thailand Won’t Send Prisoners Into the Sea”). Earlier this year, the European Union had threatened Bangkok with a trade ban due to shortcomings in its fisheries monitoring, control and sanctioning systems (See: “EU Threatens Thailand With Trade Ban”). Panya Luangsomboon, owner of Silver Sea Reefer Co. which owns several refrigerated cargo ships in Thailand, told AP Friday that the company had done nothing illegal. However, the news wire agency noted that its own investigation had revealed that enslaved workers who had returned home to Myanmar had confessed to regularly loading fish onto Silver Sea cargo ships and said they had been trafficked in Thailand and brought to fish in Indonesia aboard Silver Sea 2. The Thai Sting: A Fishing Raid in the South China SeaChina and Africa's Illegal Fishing ProblemWhat’s Behind the Missing US-Indonesia Maritime Security Pact?India Approves Procurement of 464 T-90MS Main Battle TanksWill Russia Build Borei B-Class Ballistic Missile Subs?